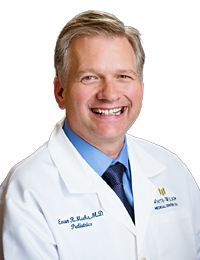 Evan Meeks, M.D., FAAP is board-certified by the American Board of Pediatrics and has been practicing at the White-Wilson Niceville Clinic. He started his career in the military right after high school, where he trained as a medic and EMT. During his time in the military he achieved the rank of E-4 and earned his "Expert Field Medical Badge." Upon leaving the Army, he attended the University of Central Florida for pre-medical studies. After graduating, Dr. Meeks re-joined the military—this time with the United States Air Force. He then attended Uniformed Services University of Health Sciences (USUHS) and earned his medical doctor degree. After 24 years in the military, Dr. Evan Meeks retired from active duty at Eglin Air Force Base in 2013 where he was head of Pediatrics. He then joined the White-Wilson Pediatric Clinic in Niceville. Dr. Meeks practices general pediatrics, and specializes in pediatric asthma. As a pediatrician, he manages all aspects of pediatric care—from routine wellness visits to diagnosing and treating childhood diseases and conditions. He also hosts the White-Wilson Asthma Group appointment classes, and is passionate about helping families manage asthma, identify triggers and learn how to utilize medications. Dr. Meeks is often referred to as the White-Wilson "Comediatrician" for his upbeat attitude and sense of humor. During his free time, Dr. Meeks enjoys fishing and has fished all around the world, from Japan to Siberia! Dr. Meeks is proud to call the Emerald Coast home with his wife and two children. The White-Wilson Pediatric Clinic was voted "Best Pediatric Practice on the Emerald Coast" and "Best Pediatrician in Destin."